One of my new year?s resolutions was to make sure that I updated my blog on a more regular basis, so the fact that here we are, seven weeks since my last missive means that I have not made a good start. However, it has to be said that I do have a bit previous for not sticking to my best intentions. Last year GM instruction editor Neil Tappin and I joined a gym round the corner from the office with the intention of getting down there three times a week. Armed with the advice of GM?s fitness expert, Josh Salzmann, our goal was to get into shape and boost our golf games. Neil has been a semi-regular visitor ? I have fared less well. In fact, if truth be told, I have had more holes in one during my golfing career than I made visits to the gym last year. Michael Harris: career aces ? one. Needless to say I didn?t renew my gym membership this year but let’s hope for better from my blog in 2007. So, in a bid to catch up, here?s a whistle-stop tour of the last few weeks at GM towers? 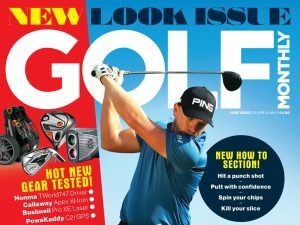 Golf Monthly has signed a leading tour pro as our new playing editor. I can?t reveal his identity yet but can give you a hint in that he is a world top-20 player. Find out who it is in the April issue. Neil Tappin, staff writer Paul O?Hagan and trusty GM snapper Tom Miles have just got back from a rather hectic week in Dubai at the Desert Classic. The intrepid trio were mainly shooting instruction and doing interviews but Paul also found half an hour to go for a ride in Greg Norman?s private jet (as one does). The office is filling up with shiny new golf gear in the run up to producing our annual equipment supplement and the result is that equipment editor Jezz is running out of? A) room to store all the boxes of kit, B) patience with all the gear freaks opening boxes to get a look, and waggle, of the latest stuff! The good news is that he has just left the office to fly out to Spain and put TaylorMade?s new drivers through their paces so we meddlers will have free access to his goody cupboard and I fully expect to see some new gear debuting on Friday. Indeed I may be requisitioning a sleeve or two of the new Titleist Pro V1s that landed last week! Last Wednesday I got to sample a new format of the game, PowerPlay Golf, at the excellent Northwick Park. For those of you who haven?t read about it on the site or seen the discussion on the message board I?ll give you a brief résumé. Dreamt up by Peter McEvoy the idea of the game is to introduce an exciting risk/reward element to play with two flags on each green. One (the black flag) is tucked away in a hard position while the other (white) is less daunting. Over the nine holes we played you had to nominate four PowerPlay holes where you played to the black flag. Birdies (gross or nett) on these holes scored double Stableford points and on the final hole there was a potential extra bonus for landing your ball in a 30ft wide circle around the black flag. I made up a threeball with one of our columnists ? Five Live?s Iain Carter ? and Golf World editor Paul Hamblin. I suffered some bad bounces on the semi-frozen greens but compounded that by playing a smorgasbord of rank shots with a skied drive that nearly put a roof mark on my beloved Titleist 905T driver the nadir. A moribund nine points was my score. The winner on the other hand came in with an unfeasible 29 points. Yes, that?s right, 29 points, a whole 20 more than me. Despite my risible return I thought it was a great idea and would be a fun and testing alternative to a the ubiquitous 18 hole medal/Stableford or perfect as a nine-hole warm-up on a society day. With the end of the April issue in sight and all the pages due to be signed off this Thursday we have an office golf day planned for Friday. This year we are hoping to get out a bit more and there is even chat of a Golf Monthly Order of Merit with this week being the inaugural counting event. The usual pre-tournament banter has been flying around and that?s been added to by a complicated discussion on how any rolling handicapping system might work. All sorts of theories/methods are being proffered but as ever at the centre of any handicap chat is Neil Tappin?s novelty handicap of 7 which most of us concur he got out of Christmas cracker. Neil tries to convince us of its validity by saying it’s just what is on the board at his home club, West Kent, but readers of this blog will know that Neil went head to head with Miguel Angel Jiménez the other month and only lost by one shot playing off scratch. Hmmm. In April Golf Monthly, (and the 100-odd other magazines published by our company) is moving offices, and as part of our preparations we are having what can only be described as the “mother of all spring cleans”. We have to lose 40% of what we have so a ruthless sort-out is in progress. While wading through the piles of stuff we have kept because “it might be useful to refer to” (but in fact isn?t), we have unearthed a number of interesting things, including hoards of fabulous old black and white pictures (including some real crackers of Sam Torrance in bad ’80s ensembles) as well as a massive collection of golf books. Sadly we have been told we can?t take all of them with us to our new offices so to avoid having to discard them we?re going to offer them up as competition prizes throughout the month of March. Keep an eye on the competition page if you?d like the chance of adding to your golfing book collection.